State of the World 2004 takes a fresh look at the trends that have put the global economy on a collision course with the Earth's ecosystems. This year's edition has a special focus on the theme of consumption. It questions whether a less-consumptive society is possible; and concludes that it is essential. The book explores overconsumption, a by-product of affluence; and underconsumption, linked to poverty, and provides 'behind the scenes' exposes of the devastating environmental impacts of some of our most popular products, from plastic bags, to paper, to mobile phones. Published annually in 28 languages, each edition draws on the breadth of expertise of Worldwatch's award-winning team of writers and researchers. 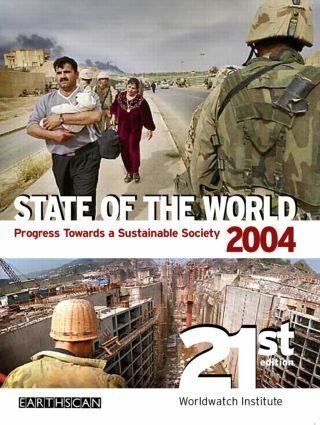 State of the World is relied upon by national governments, UN agencies, development workers and law-makers for its authoritative and up-to-the-minute analysis and information. It is essential for anyone concerned with building a positive, global future.